CAST: Steve Carell, Bryan Cranston, Laurence Fishburne, J. Quinton Johnson, Richard Robichaux, Lee Harrington, Cicely Tyson, Kate Easton, Deanna Reed-Foster, Yul Vasquez, Graham Wolfe, Ted Watts Jr. 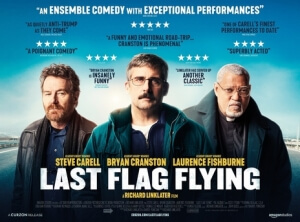 If you read the previous review of Last Flag Flying at its initial screening at the London Film Festival, then you’ll know that the overall consensus was that it was a pleasantly mellow film about three old army buddies reuniting for an emotional cause, which was bolstered by the exceptional lead performances and the always-reliable direction by Richard Linklater. Now that it’s gotten an official UK theatrical release – although only at a handful of locations as of this review, which is a bit unfair seeing how it’s a movie a lot more people would like if they got a chance to see it – I can reiterate that it is still a nice little movie that, while certainly not among the instant classics that Linklater has made in the past, coasts nicely on the incredible chemistry of its three leads. Basically, a lot of this review may just be me repeating a bit of what I said previously, but as long as the movie gets a bit more exposure I hope you won’t mind it as much. The film is a spiritual sequel to the 1973 Jack Nicholson film The Last Detail, but don’t worry, a viewing of that film before this one is not at all required. Set in 2003, right when the Iraq war is in full swing, Larry “Doc” Shepherd (Steve Carell) locates and reunites with his former Marine buddies Sal (Bryan Cranston) and Mueller (Laurence Fishburne), the former now operating a small-time bar and the latter a heavily religious preacher. He tells them that, a couple of days prior, he learned that his son was killed whilst on duty in Baghdad and wants his old friends to accompany him to Washington so he can visit his son’s coffin. After the revelation that his son may not have died as heroically as the military would have him believe, Doc decides he wants his son buried in his hometown in New Hampshire, and he, Sal and Mueller end up on a cross-country journey together where they reminisce on times they spent in the Marines, both good and bad, as well as reflecting on how much the world they now live in has both changed and not changed at all. Watching this movie a second time was a mellowing experience, because now that I was familiar with the basic premise and what happens to these people along the way, it gave me the opportunity to just sit back and become more engrossed with the conversations these characters have with each other, from the most mundane things to really digging deep into their past exploits during the Vietnam war. Linklater is such an expert on making every single exchange his characters have with one another that it never feels corny or forced, instead they come across as so natural you’d swear they were just coming up with these lines right there and then. He’s made such a vibrant filmography of people just talking to each other and coming across as actual people rather than just characters, that you’d swear his style of direction is simply sitting in the park and listening to everyone around him engage in natural conversation for inspiration, and the results are extremely soothing and pleasant to behold, with this one being no exception. As strong a director as Linklater is – not to mention co-writer, since he also penned the screenplay with Darryl Ponicsan who wrote the novels that both The Last Detail and Last Flag Flying were based on – the true MVPS of the film are hands down the impenetrable trio of Carell, Cranston and Fishburne. Seeing this movie a second time really does help you appreciate each one of their performances even more, as they can be funny, sad, empathetic, angry, and all different kinds of emotions with such ease and the kind of natural charm that only really good actors like them can really pull off. Cranston is by far the scene-stealer of the three, earning the biggest laughs by far as a guy whose wisecracking and laid back attitude is so infectious it almost hurts; he is also playing a version of the role that Jack Nicholson played in The Last Detail, and you can see a little bit of Nicholson in the way that Cranston delivers some of his lines, though he certainly makes it his own in more ways than one. Fishburne, meanwhile, has a warm and spiritual presence to him as he acts as the calm but incessantly human moral centre of the group, but also at poignant times reminds us that he is still a functioning human being with problems just like everyone else. Finally, I think it’s time we acknowledge that Carell is an incredible actor no matter what genre you put him in; whether it’s the silliest comedy or the more serious drama, he is nothing short of excellent, and here he says so much with just his sullen expressions and closed-off body language that often he doesn’t even need dialogue to get across how he’s feeling. All three of them are so good together, and whenever they are deep in conversation about anything from old war stories – an exchange about their trip to a brothel district in Vietnam called “Disneyland” is especially fun – to just asking each other simple questions that tell us more about them as individuals than we would ever have expected to know, they sell them with hardly any false steps or insincerity. As much as it would be wonderful to just put these three actors in a room and watch them bounce conversations off of one another for just over two hours, it’s often easy to forget that there is still a thoughtful and delightfully mellow movie surrounding them, which I reckon is still a good little movie to check out. Whether you like any or all three of the lead actors, or you’re a fan of Linklater’s work, or just looking for a nice film to put on and become lost in a deep sea of pleasant conversation, then Last Flag Flying is just as worth your time as any other film like it. Last Flag Flying is a delightfully mellow and pleasant film about three characters, played exceptionally by Steve Carell, Bryan Cranston and Laurence Fishburne, coming together and reminiscing about their past and present, which director Richard Linklater manages to make feel so real and likeable with his realistic and natural filmmaking.